At Lorne Park Dental, we go above and beyond to make sure that our patients feel comfortable. To us, you are part of the family. 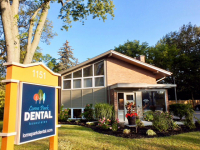 The dedicated, knowledgeable Lorne Park Dental team in Missisauga is committed to providing a wide range of quality dental services for children, teens, adults and seniors in a fun, family-oriented practice.